Spring always reminds me of flowers, as I'm sure it does for most people. I know we will be seeing many more flowers incorporated into desserts and sweet treats starting over the next few weeks. Lots of pastel colors will probably be making their way into pictures too, I'm sure they will be beautiful. 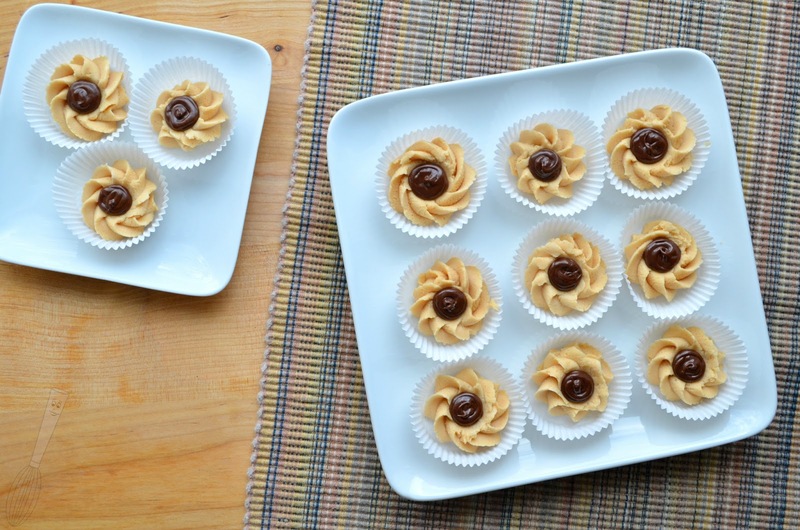 These little peanut butter flowers are bite size and perfect for a small tray of sweet treats. 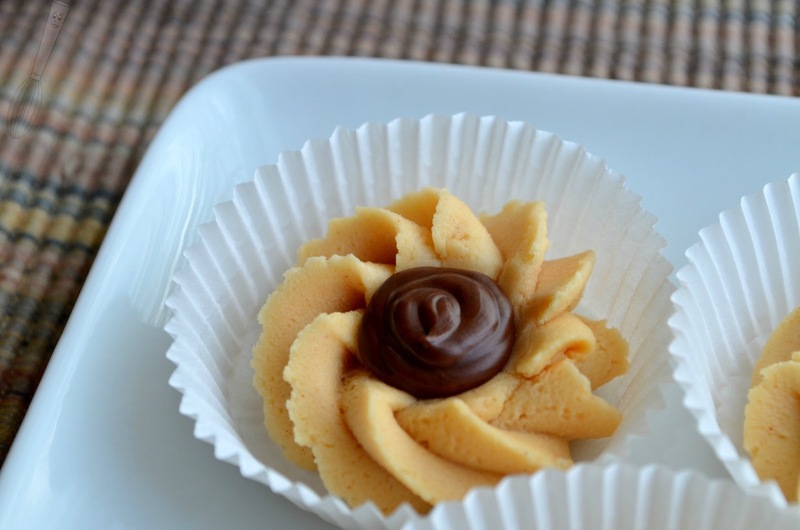 The flavor combination is the same as the well known buckeyes but presented in a different way that's perfect for Spring. You can pipe these into any size or shape that you want to and they could also make a lovely decoration on a cake or cupcakes that could be premade. 1. Line a sheet pan with non-stick foil (or use a Silpat), set aside. In the bowl of a mixer, blend together the butter, peanut butter, and vanilla extract for 1-2 minutes or until blended together completely. 2. Add 1 cup of powdered sugar and blend on low until mixed. Add 1 tablespoon of milk then blend again until smooth. Add an additional cup of powdered sugar and mix, then add 1-2 more tablespoons of milk until the mixture is smooth and able to be piped through a pastry bag but not too soft so it won’t hold it’s shape (I used 2 ½ tablespoons total). 3. 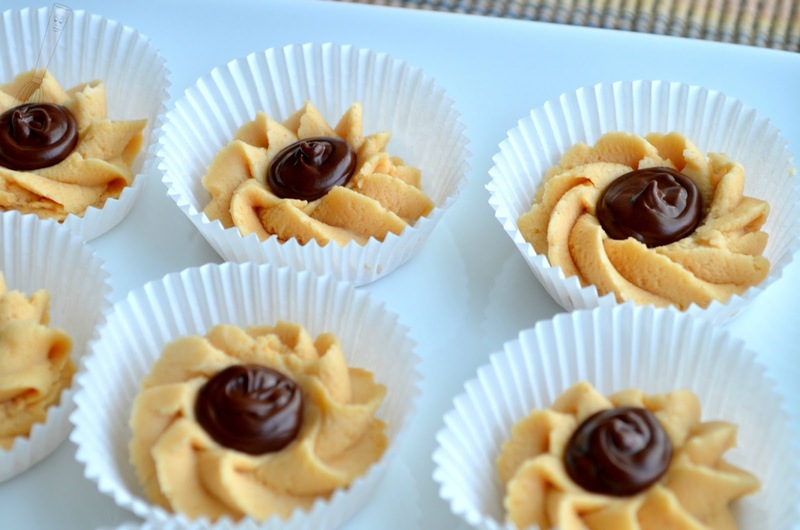 Transfer the peanut butter mixture to a pastry bag fitted with a star tip (or a freezer zip top bag may work). Pipe rosette style shapes onto the sheet pan (If you just try to dollop a star shape it probably won’t stick to the foil or Silpat well enough). With the back of a rounded spoon make an indentation in the middle of each rosette. 4. Put the sheet pan into the refrigerator for the flowers to become more firm, for at least 30 minutes. While the flowers are chilling, melt the chocolate in the microwave for 30-45 seconds, stir until as smooth as possible, and if necessary for another 10-20 seconds. Be careful not to overheat the chocolate or it will cease and become too thick to use. 5. Put the chocolate in a small pastry bag with a small tip or a small zip top bag with the end snipped off. (I used parchment paper that I made into a cone shape for a bag). 6. Pipe the chocolate into the indentations of each rosette making the “center of the flower”. Chill the flowers until ready to serve. (I used a small metal angled spatula to remove them from the foil and transfer them to the cups and it worked really well).